The Southern Couterie blog recently interviewed me about my favorite parts of my hometown, Montgomery, Alabama. You know how sometimes you only truly realize how great a place is once you have left? Well, that was certainly true for me as I realized what a gem Montgomery is when I gave this interview. If you are considering a visit to Montgomery, here are my suggestions. And don’t forget to visit our showroom there too. If you come on the right day, you will see me there and I just might give you a peek at the studio, if you can pull me away from my Louisa’s Cafe smoked turkey and avocado sandwich! My parents were both artists, so I grew up among galleries and art openings and can attest to the amount of cool and quirky people in Montgomery. Creativity abounds from the fine arts to the dramatic arts to the quality of the stores and restaurants in town. For those of you who simply know Montgomery from passing it on the highway on your way to the beach, this is the side you don’t see…but should. Before we start on where to go, I think it is important to understand how important the role of a home is in Montgomery. Montgomerians entertain in their homes and therefore make an effort to create a home that lends itself to hospitality and entertaining. Garden clubs, book clubs, and Bible studies often meet in homes. If you have a new neighbor, you invite them to dinner at your home and serve a home cooked meal. If your friend is getting married or having a baby, you host a shower for them at your home. If you meet a new friend and you want to get to know them better, you invite them to dinner at your home. I thought this was commonplace in every town until someone who had recently moved to Montgomery mentioned the difference. For more established friendships, a fairly unique aspect of social life in Montgomery is supper clubs. Other cities have these but in Montgomery, almost everyone is a part of a supper club whether they have titled it a “supper club” officially or not. A supper club is a group of friends who have decided to meet for dinner on a regular basis, and again this is almost always a dinner held in a home. The members often rotate who hosts the dinner each time. These groups are usually no more than 20-30 people (if it becomes too large it’s not as personal anymore) and they truly commit to one another and their family. These families grow old together and become a mini community within the larger community. Even when life keeps them from meeting together as regularly as they once did, they can always pick right back up where they left off like true long-time friends can do. These are not just the friends you party with, these become the friends who are with you through thick and thin. The friends who will host the graduation party and engagement party for your children (again probably in their own home) and these are the friends who bring you a meal when you are sick and cry with you when life is really disappointing. Debutante balls are a big part of social life in Montgomery and have been for generations. (Consider the fact that it was a Montgomery debutante ball Where F. Scott Fitzgerald first met Zelda.) Many of these balls originated from The Mardi Gras balls of Mobile (Mobile is the actual origin city of Mardi Gras, not NOLA). In Montgomery, you almost cannot throw a dart at the calendar from January through February without hitting the date of a debutante ball. And these balls are great big parties. There are t-shirts which came out a few years ago that read, “Montgomery parties harder” and it’s an appropriate t-shirt. Jubilee Seafood: for fresh-off-the-boat-that-morning seafood, there is nothing like Jubilee. Operated under the same owner for 25 years, who once told me that he won’t buy fish except over the phone because he “wants to hear the pause”. When he asks if it’s fresh, if they pause he knows it’s not. And you “can’t hear the pause over email.” We sit at the bar and eat gumbo or grab a more upscale fish meal at a table. Their West Indies Salad is absolutely amazing. Located in Old Cloverdale. Hamburger King: “Calories be damned”, this is hands-down the best hamburger EVER. They are specialists–you can order a hamburger, a can of coke and chips. That’s it. And everyone loves it. Located in Downtown, you might even see the Alabama Attorney General at lunch. Cafe Louisa: Located in Old Cloverdale near our store, Louisa’s smoked turkey sandwich with avocado and sprouts is the favorite sandwich of choice by the ExVoto team. And they have the best cookies ever. Missy Mercer, the owner, is a french pastry Chef and bakes the bread and cookies. Louisa’s makes a fabulous latte, too. Oh and GELATO! Dreamland near the river front is my go-to for BBQ. Central: near the River Walk, this is fine casual dining with a great vibe. We love the historical building with exposed brick walls and their great patio. Vintage Year: A must for steak and seafood. Tomatino’s in Old Cloverdale serves up great pizza. El Rey Burrito Lounge in Old Cloverdale is a great experience with delicious food. The Brass Fountain for tabletop and gifts. Where half of Montgomery registers for their wedding, this has been a valued staple since the 1960s. The area of Old Cloverdale is a little of an interiors mecca. I love both Parish and Ashley Gallioninteriors. Cottage Collection antique store has a good selection of fine antiques and budget friendly finds and has been in business for 30+ years. Stonehenge is a beautiful framing shop that also creates lighting; they can create a custom lamp from almost anything you bring in. Al’s Antique Gallery and floral design on Mulberry Street is another favorite for interiors. For clothing, I love Welle Studio in Old Cloverdale–run by two women, one an architect and the other a buyer–as well as Painted Pink on Mulberry Street. The Equal Justice Institute’s Legacy Museum and National Memorial for Peace and Justice are new to town and we couldn’t be more proud to have these amazing institutions here in Montgomery. Click the link to read more about the EJI and what they do, and when you can visit the Legacy Museum and the Memorial. The Montgomery Museum of Fine Arts is in a beautiful building and is free to the public! 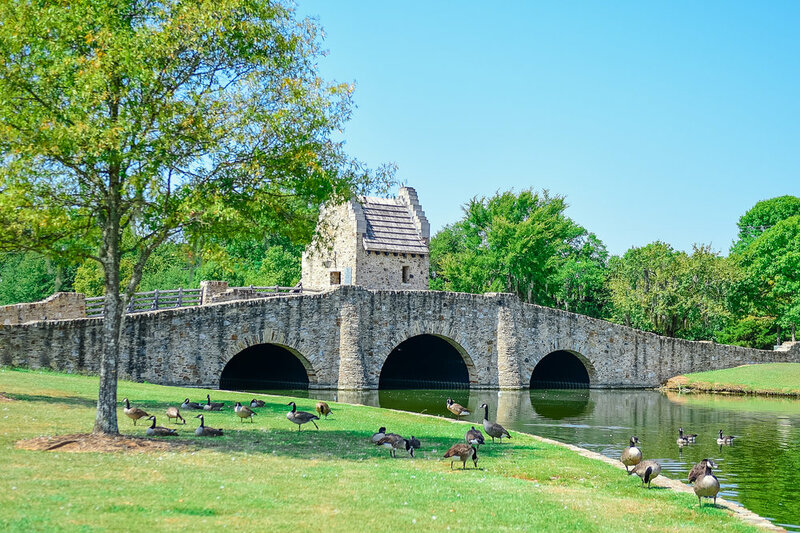 It has an interactive arts area for children and in a gorgeous park setting–even with a pond of ducks, geese and swan. The Museum is situated on a large piece of land with the Alabama Shakespeare Festival. I’ve seen Mary Poppins both on Broadway and at the Alabama Shakespeare Festival and it was just as good in Montgomery as it was in New York. There are a number of musicals that go from here to Broadway. I also love the Fitzgerald Museum and the Montgomery Performing Arts Centre. One of my favorite cultural activities is to simply wander around Downtown. These are the buildings that influenced me to go to architecture school. I also love driving through Old Cloverdale with all of its historic homes. Another favorite is Old Alabama Town (the first image with the bright yellow tree). 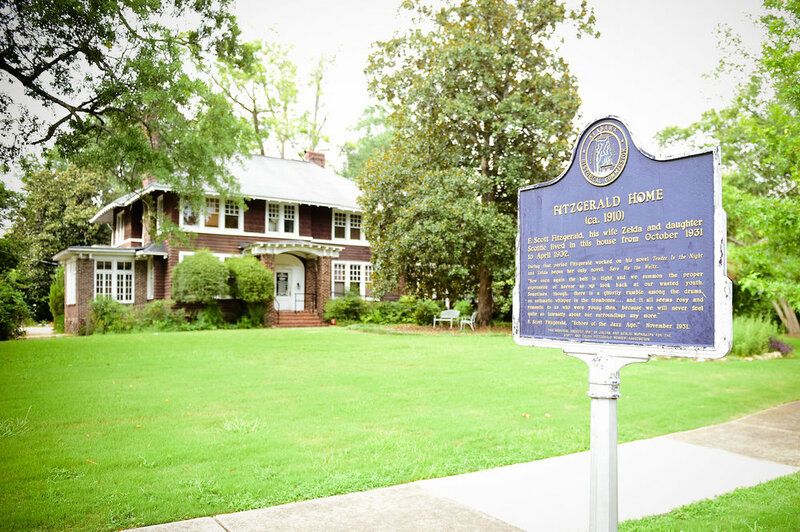 Historic homes and buildings from all over Alabama have been moved here and can be toured. Lots of history here. My wedding reception was held at Young House and it is a restaurant serving lunch now. You can also find the Adams schoolhouse in Old Alabama Town which is a one-room schoolhouse that one of my husband’s great-grandfathers began. There are also a number of cultural venues situated on the Alabama River. The Train Shed is an old train station with its original stained glass that is now used for concerts and events. It is now a National Historic Landmark and sits on a bluff overlooking the river. The Riverwalk Amphitheater is an outdoor venue that overlooks the river and hosts concerts, plays, dances, and special events. And of course I’d recommend taking a river boat cruise on the Harriott II Riverboat, a 19th-century riverboat docked beside the Riverwalk Amphitheater. All photos in this blog post are by local Montgomery photographer (and ExVoto client) Jessica Govan. You can also shop the ExVoto Collection online here.